3D METAL FORMING is the global leader in METAL FORMING of very large and complex, double curved, shapes for the Aerospace, Architectural and Energy/Big Science Markets. 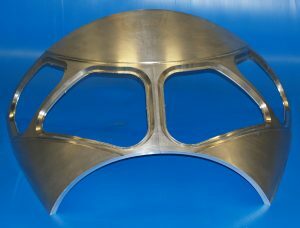 For the Aerospace Industry in particular the company can form both Near-Net-Shapes out of thick plate and Final product shapes out of sheet metal. They are specialised in Low Cost forming complex shapes out of thick plate is an “Enabling Technology” for designing and manufacturing Monolithic Integral Aerospace Structures eliminating the need for (sub)assembly. Furthermore parts currently machined out of thick block material can be manufactured more economical if machined starting from our Near-Net-Shape.The same process is used for manufacturing Near-Net-Shapes in ie. Invar for the product facing surface of moulds for composite parts.The metal forming process used is High Energy Hydro Forming were they ignite High Energy Material under water while the resulting water wave pushes the blank onto the male or female die. Because they use a High Velocity Forming technology it brings benefits like forming in T4 condition which can save Heat Treatment steps in comparison to conventional forming technologies as: Press Forming and Spin Forming.The company's production is capable of producing parts at a rate of #75 a month. L = 2,5 m., W = 2 m., Thickness 80 mm., AA2050.